Emilie Carolyn Glen was older — older by decades — than she wanted us to believe. When interviewed by a fellow writer, she would terminate the conversation when the delicate question of age came up. In the 1977 International Who’s Who in Poetry, Emilie listed her birth date as 1927. In a later directory, she revised that to read 1937. (1) Actually, Emilie was born around 1906, making her 63 years old when I first met her in 1969. In the 1960s, the poet found herself a fixture in several Greenwich Village coffeehouses, where she read her poems and played piano. One of her few vitriolic poems of that period, an unpublished denunciation of a Flamenco-playing coffeehouse owner, suggests the bitterness of a failed love affair. In response to requests from patrons at the coffeehouses, starting in 1966, Emilie had little mimeo-graphed chapbooks of her current poems run off and hand-stapled (Coffeehouse Poems, Mad Hatter, Paint and Turpentine, and others). 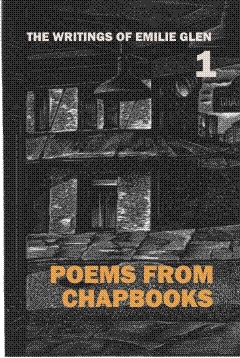 The text of these pre-Poet’s Press productions are included in this volume. I was unable to locate copies of three chapbooks, Painted Door (1967), Just Because (1970) and Laughing Lute and Other Poems (date unknown). If they come to light, I will include the poems in one of the later volumes in this series. Thanks to the inept management of her finances by her bankers, what had been a secure income from interest was turned into a charge account which Emilie and her grandson quickly exhausted: every time she ran up the credit card to the limit, her financial “advisor” sold off more stock. Finally, Emilie was left nearly destitute, and as dementia set in, she could no longer find her way even a few blocks from her house without becoming hopelessly lost. Diagnosed with advanced Alzheimer’s, she was committed to a nursing home. There, she gradually lost all interest in poetry, and in a final act of will, stopped taking food. She died on the last day of 1994. HEAR EMILIE GLEN READING HER POEMS. Click on file name and play with your browser's default media player for MP3s.